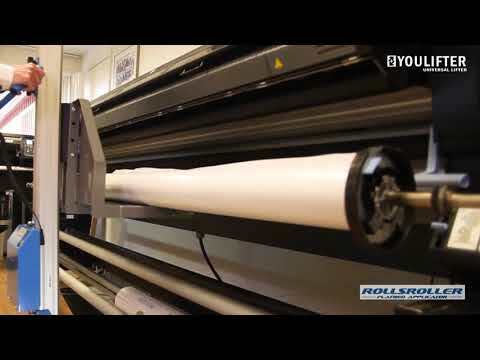 Want to see ROLLSROLLER Live? The Youlifter is an electrical lifter constructed and developed to create a better working environment and better ergonomic which will increase your productivity. The lifter fits perfect in the graphical sign production but also in other industrial environments where lift support is needed. Youlifter comes in three models: Youlifter 120P, Youlifter 90IE, Youlifter 60E. Repetitive handling and heavy lifts increases long term injuries. With today’s higher demands of output required, the effect of absenteeism is negatively impacting productivity. The YOULIFTER is the solution. More and more companies today have focus on creating healthier and happier workplaces. The YOULIFTER provide ergonomic work environment and contribute to the positive impact this has on employee health and safety. See download tab for product data sheets. Need advice? We can help you! Fill in your details and our experts will contact you! Yes, I want your newsletter to be sent to my email.